A regional outreach event for disabled people and their families will take place this Saturday from 4 to 7 p.m. at the Hardin County Fairgrounds. 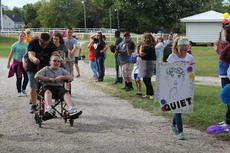 Event organizer Gary Rock of Hodgenville said the second annual Luke 14 event is an event that makes people with disabilities and their families feel like an honored guest. He said the event will be for all disabilities, both mental and physical, and that it is not specific to just one disability like a lot of other events. Life skills; we all need them to function in society as independent adults. 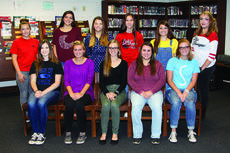 But, for some LaRue County High School students, cooking, making a grocery list or money-managing skills is best learned through a unique classroom environment. “Community Based Instruction (CBI) is designed for students that need intensive instruction in functional and daily living skills. It is instruction in community environments, providing real life experiences for students,” said Casey Sidebottom, Special needs teacher at LaRue County High School. If the old expression, “If only walls could talk,” were to come true, the walls where Lincoln National Bank is in Hodgenville could speak volumes. The storied building site, on the square’s northeast side, has housed many businesses since the town was established on February 9, 1818 (according to a 1920 history of the town by O.M. Mather). For most of his adult life John Will Cox, 1871-1946 was either a part-time or full time blacksmith. The village blacksmith, or smithy as he was sometimes called, was an important member of society in the 19th and first part of the 20th centuries. 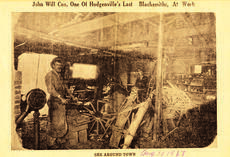 The blacksmith kept the plow points sharp, the wagon wheels rolling and the horses and mules fitted with new shoes as well as many other jobs for the farm families of LaRue County. Next Wednesday, September 28, Paula’s Hot Biscuit located at 311 W. Water Street in Hodgenville, will be giving away to their customers, The LaRue County Herald News newspaper, FREE with any purchase. It’s a great time to come meet your friends and family for breakfast or lunch, and get a FREE Herald News. We are excited to announce this year’s LaRue County Herald News Photo Contest. This year’s theme is “Discover”, and we are excited for our readers to submit their photos. We are also pleased to announce that, in addition to category winners, we will choose an over-all winner who’s winning photo will appear in our 2016-17 county guidebook Discover LaRue County. Keep in mind, preference will be given to photos taken in LaRue County. Dawn Pawley Simpson to Donald Skees and Ann Skees, property beginning in the west line of Donald Skees tract 5 Leona Terry Estate agricultural division, $26,000. Lawrence R. Thomas by and through Della Ree Thomas, his attorney-in-fact and Della Ree Thomas to Michael Ray Thomas and Willie Dean Thomas, tract three of the record plat of and for the Lawrence R. and Della Ree Thomas agricultural division, $FMV 75,000. 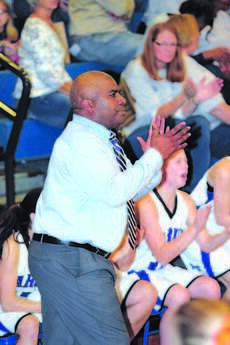 The former head coach of the LaRue County high school and middle school girls basketball teams resigned on Monday after he was indicted for first degree sexual abuse. Kelton “Simon” Ford, 48, of Horse Cave was indicted by the LaRue County Grand Jury on Monday for first degree sexual abuse as a result of an ongoing investigation by the Kentucky State Police since September 7. According to the indictment, Ford engaged in sexual contact with a female juvenile by the use of forcible compulsion on September 7. LaRue County’s very own Dale Dobson has been traveling the state this week educating people about farm safety in honor of Farm Safety and Health Week in Kentucky. Kentucky Commissioner of Agriculture Ryan Quarles signed a proclamation last week declaring September 18-24 as Farm Safety and Health Week in Kentucky to promote safety on the farm. In the fall, Quarles said that message extends to Kentucky roadways, where motorists often encounter farm machinery moving from one field to another during the harvest season.